ㆍ도서산간,제주도 등 일부지역은 추가 배송비가 발생되오니 주문전 확인 바랍니다. ㆍ업체직배송 상품은 오프라인 매장에 재고를 갖고 있지 않습니다. 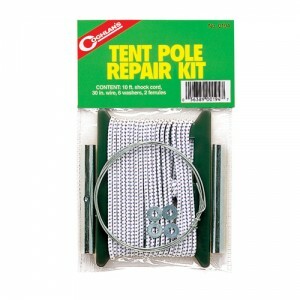 #0194 Tent Pole Repair Kit Fix broken tent poles quickly. Contains: 45” (114 cm) shock cord, 30” (76 cm) wire, 6 washers, 2 ferrules.